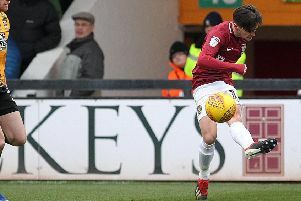 Sky Bet League One has been in the spotlight this week thanks to the FA Cup exploits of both Wigan Athletic and Rochdale - and Cobblers boss Jimmy Floyd Hasselbaink says those results are an indication of the quality of the competition this season. Paul Cook’s promotion-chasing Wigan were dramatic 1-0 winners over Premier League leaders Manchester City on Monday night, ending Pep Guardiola’s side’s hopes of winning the quadruple and progressing into the quarter-finals in the process. Just a day earlier, Rochdale, who are bottom of league one, had played superbly to claim a deserved 2-2 draw with another one of the Premier League’s big guns in Tottenham Hotspur at Spotland, with Keith Hill’s men scoring a late, late equaliser to set up a replay at Wembley. Both matches were beamed into the nation’s living rooms as they were shown live on BBC1, and the performances of both the Latics and Dale will have left nobody in any doubt that there is real quality in the third tier of English football. But then, that is something Hasselbaink was already well aware of. “League one is getting stronger, and there are better coaches and better managers,” said Hasselbaink, who also managed Burton in league one in the first half of the 2015/16 season before leaving to join Queens Park Rangers in the Championship. “There is better tactics, better understanding of the games, better players, and players can run as well, all of them. The Cobblers, who in 2018 have lost narrowly 1-0 at home to both Wigan and Rochdale, are preparing to host Oxford United on Saturday. Town are still looking over their shoulders at the relegation zone, which they are two places and one point above. They stayed a point clear of the bottom four with a 2-2 draw at Scunthorpe United last weekend. Hasselbaink was pleased with the result, and pleased with some aspects of the performance, and he now wants to make sure his team takes the positives from the trip to Glanford Park into this weekend’s date with the managerless and out-of-form Oxford. “It was a good outcome, although it wasn’t brilliant,” said the Cobblers boss of the draw with the Iron. “I thought the performance could have been better here and there, but it was a big improvement on the Tuesday game (against Gillingham), which was needed. “It is now down to us to take that, and bring that performance and better into our home games.